This artifact closely resembles a scalpel. It has a handle on one end, and a sharp blade on the other. Archaeologists also found stone mortars used to grind plants and other medical tools on the site, revealing that these pre-Columbian tribes possessed medical knowledge, and the Trepanned patients received herbal medical treatment to heal. The first to use the word “scalpel” were the Romans. The word comes from the Latin ”scallpellus”, which was crafted during the golden age of surgery in Rome. During the second century AD, Celsus and Galen were the leaders of surgery and followed the teachings of Hippocrates. The ancient Romans were proficient in the art of making cutting instruments. Spears, knives and lances made out of bronze and iron have been found in many archaeological sites, like Pompeii. After this century came the Dark Ages, where knowledge of surgery was lost and advancements in surgical instruments stopped. Medicine fell into the hands of religious fanatics. Superstitions further crippled medical knowledge. It wasn’t until the 16th century when Ambroise Paré, a barber surgeon, improved and refined surgical instruments more than anyone else before his era.3 During Paré’s time, physicians were the educated ones in diagnostics and academic medical practice, but the general tasks were left to barber surgeons. A doctor would diagnose and order the administration of procedures, which were carried out by barber surgeons. The latter also cut hair and pulled teeth for a living, so any surgical procedure would cause the patient pain. Sometimes, the pain was so excruciating, that patients would lose consciousness and faint. A quick and painful procedure was warranted at that time, since there was no use of antibiotics or anesthesia. Pain was an accepted part of surgery until Paré discovered that a gentle handling improved and transformed his patients. In1537 he broke away from traditional practices. He replaced the boiling oil solution needed to cauterize gunpowder-driven wounds with a soothing balm made from egg yolk, rose oil and turpentine. The following day, Paré was amazed to find that the patients who had received this new treatment were resting peacefully, while the cauterized ones were suffering in great pain and swelling around the edges of their wounds.4 Paré’s discoveries exerted a powerful influence over physicians and medical knowledge of the 16th century. He is considered the father of modern surgery. It wasn’t until the 18th century that the profession of making surgical instruments was recorded in history. In the United States, the manufacture of surgical instruments developed slowly. It was after the first and second World Wars that American industry managed to catch up in manufacture leadership. John Sklar, for example, saw the need for American made surgical instruments and founded a company in 1892. He became the main surgical instrument provider for the American military forces during these wars and managed to establish himself at the forefront of the surgical marketplace shortly thereafter. The modern scalpel, or surgical knife, has to meet specific requirements. The most important requirement is sharpness. This is why most scalpels have a disposable blade, to guarantee best performance. Other features are: shape, rigidity, balance, uniformity and dependability.5 The way a surgeon handles the scalpel is also important. It should not be held like a hammer, a racquet, or a pen. It should be handled the same way a violinist holds a bow. In a surgical procedure, the scalpel becomes an essential tool for the surgeon’s actions. 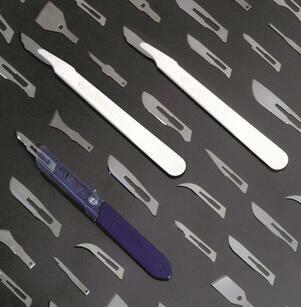 Today there are more than 67 types of scalpel blades and 27 types of handles. Scalpels are labeled in two categories-- reusable and disposable. Reusable ones have a disposable blade, which is usually thrown away after its first use, attached to a reusable handle. Disposable surgical scalpels usually have a plastic handle attached to a retractable disposable blade. These disposable scalpels are single-piece, they are meant to be used once then thrown away. Many surgeons prefer them because they are lightweight and ready to use, whereas with reusable scalpels, one needs to take care while changing blades. Most blades are made of carbon or stainless steel. Although obsidian blades have also been around since prehistoric times, and there is evidence showing that obsidian scars heal better, this material is not Food and Drug Administration (FDA) approved. Obsidian is quite brittle and breaks easily when force is applied, making it unsafe for widespread use.6 In Germany, however, there is a manufacturer that does produce obsidian scalpels that can be used in rare cases where the patient is allergic to metal. This makes us ponder, what will scalpels be like in the future? There are many complex neurosurgeries and eye procedures where a laser scalpel is more commonly used due to practicality. Yet, there still are many surgical procedures that require the use of a scalpel. Although technology keeps adding to medical breakthroughs, there are still some tools that continue to be essential. If you would like to browse or learn more about Sklar's high quality scalpels and blades, please click the button below. 1 Cooley, Denton A. MD. (2009). Surgical Knife. 2 Klimczak, Natalia. (2016, August). 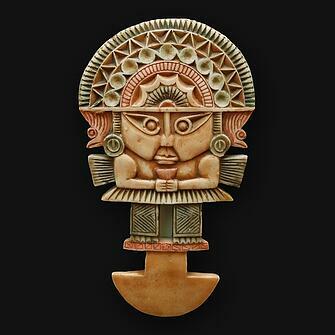 4,000-Year-Old Stone Scalpels Found in Peru Shed light on Ancient Medical Practices. 3, 5 Ochsner, John, MD. (2009). Surgical Knife. 4 Drucker, Charles B. (2008 December). Ambroise Paré and the Birth of the Gentle Art of Surgery. 6 Shadbolt, Peter. (2015 April). How Stone Age blades are still cutting it in modern surgery.